Whether you know him as David B. Coe or D.B. Jackson, there's no doubt that David has put his mark upon the fantasy genre. While many readers may be more familiar with his current projects, Case Files of Justis Fearsson and Thieftaker Chronicles, I had the great pleasure of reading his debut LonTobyn Chronicles as they were released. With that trilogy not only back in print, but now available in a preferred Author's Edition, I'm exceptionally excited to be able to host David as part his celebratory tour. 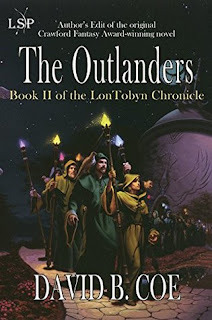 I have recently released the Author’s Edit of The Outlanders, volume two in my Crawford Fantasy Award-winning LonTobyn Chronicle, and the second novel I ever wrote. 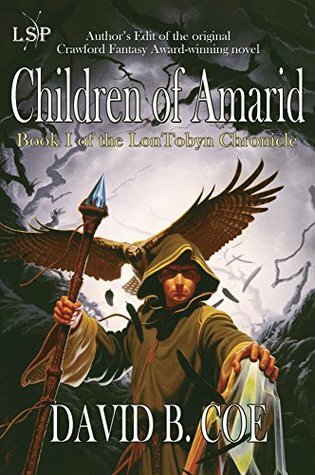 This follows the release in July of the Author’s Edit of Book I in the series, Children of Amarid. The new version of the final book in the trilogy, Eagle-Sage, should be out in December. Not surprisingly, these books -- my first trilogy -- are special to me. They established me critically and commercially, and sold well for many years; it bothered me when they went out of print in the mid-2000s. So when my agent and I had the rights to the books reverted back to us, I knew that I wanted to get the books out in front of the public again. But I also knew that I wanted to edit the books first. Most writers will tell you that their first books, while dear to them and in many respects very good, are also flawed. My LonTobyn Chronicle was no exception to this. The stories were fun, fast-paced, readable; the characters were well realized and relatable; the world building was complex and intriguing. But the writing itself suffered due to my lack of experience. And so the idea of the Author’s Edit. Think of these new versions as the Director’s Cut of the books. I kept everything that I loved -- the pacing, the storyline, the characters, the magic -- and changed other stuff that had always bothered me about these books. I tightened up the prose, got rid of a TON of adverbs, removed unnecessary dialog tags, gestures, and facial expressions, and cut some exposition that didn’t need to be there. The result is a book that’s 14,000 words shorter (though still close to 200,000 words long) and far easier to read. But the edits were more than just cleaning up a bit of clunky prose. They were a learning experience in many ways. Some people have asked me if I wished I could have rewritten the books from scratch rather than just editing them. And the answer is no. These were and are good books. More, they reflect a passion and ambition that, I believe, is unique to first books. I know: That seems to contradict what I said about first books a little bit earlier. In fact, it doesn’t. Let me explain. I had so much to learn as a young author. I was honing my craft, figuring out my voice, looking for ways to set myself apart and make my mark on the genre. So in some respects the work was bound to have some shortcomings. I was a rookie, and like all rookies I lacked polish. But at the same time, I was thrilled to be writing, and bursting with all sorts of ideas for story, for setting and magic, for characters. The Outlanders in particular was an ambitious novel and, in part for that reason, one of my favorites of all the books I’ve written. It was ambitious because it had two distinct venues, a pastoral land that possessed magic but only medieval level technology, and a highly developed urban land with tech that outstrips our own. Blending those two threads into a coherent whole was challenging to say the least. And yet it worked, in large part because the characters I created for the book were far more complex and interesting than any I’d written before. This was a “bigger” book than Children of Amarid. Not longer, but further-reaching. I tried to do more, I strayed more from my comfort zone. And in doing so, I proved to myself that I could write more than one kind of book. Reading through this first trilogy has inspired me. I’m actually working on a new epic fantasy now, after taking a hiatus from the genre that has lasted some six years and seven books. I’m not returning to the LonTobyn world for this new project -- far from it. But I’m drawing on lessons I learned nineteen years after the fact from that younger me who wrote the first series. I’m pushing myself to take all sorts of creative chances, following bolder storylines and developing exotic characters. I’m writing leaner, sparser, the way I wish I’d written the old books. In short, I’m trying to make this next project something that the younger me would think was totally cool and the older me sees as an expression of all I’ve learned through my career about writing and storytelling. That, in the end, is the best thing that’s come out of this process of editing my old books. I feel that I’ve engaged in a dialog with myself, the older me and the young me. The result is a new version of an old trilogy of which I’m now doubly proud, and a new approach to an old writing passion that has me deeply excited about my writing future. David B. Coe/D.B. 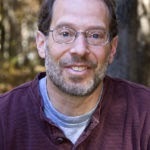 Jackson is the award-winning author of nineteen fantasy novels. As David B. Coe, he writes The Case Files of Justis Fearsson, a contemporary urban fantasy from Baen Books. The first two books, Spell Blind and His Father’s Eyes came out in 2015. The third volume, Shadow’s Blade, has recently been released. Under the name D.B. Jackson, he writes the Thieftaker Chronicles, a historical urban fantasy from Tor Books that includes Thieftaker, Thieves’ Quarry, A Plunder of Souls, and Dead Man’s Reach. David is also the author of the Crawford Award-winning LonTobyn Chronicle, which he is in the process of reissuing, as well was the critically acclaimed Winds of the Forelands quintet and Blood of the Southlands trilogy. He wrote the novelization of Ridley Scott’s movie, Robin Hood. David’s books have been translated into a dozen languages. Four years after the insidious, devastating invasion by agents of Lon-Ser, Tobyn-Ser’s Order of Mages and Masters is riven by conflict and paralyzed by inaction. From the outlander, Baram, they have learned much about their neighbor to the west: Unlike Tobyn-Ser, which is served by the Mage-Craft of the Children of Amarid, Lon-Ser is devoid of magic. Instead it possesses a dazzling and deadly technology that shapes every aspect of its people’s daily life. Frustrated by the Order’s inability to act, Orris, a young, rebellious mage, takes it upon himself to prevent further attacks on his homeland. Taking Baram from his prison, he embarks upon a perilous journey to Bragor-Nal, an enormous, violent city in Lon-Ser, ruled by a brutal, feudal-like system of Break-Laws, Nal-Lords, and Overlords. As Orris soon learns, however, Baram has been driven insane by his captivity. Upon reaching his strange and fractured homeland, the man abandons Orris. Armed only with his magic, Orris is thrust into a world whose language he does not comprehend and whose technology he can barely fathom. 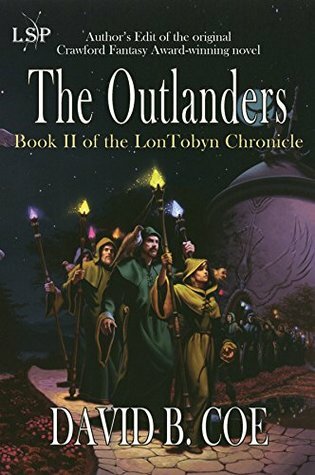 Together with Gwilym, a man with strange powers, whose vision of Orris has lured him out of the mountains and into the chaos of the Nals, and Melyor, a beautiful Nal-Lord who harbors a secret that could cost her life, Orris must end the threat to Tobyn-Ser without getting himself and his companions killed. THE OUTLANDERS is the second volume of the LonTobyn Chronicle, David B. Coe’s Crawford Award-winning debut series. This is the Author’s Edit of the original book. Awesome! And thanks for the giveaway! Thank you so much for hosting me, Bob, and for the very kind introduction. Greatly appreciated. I was given the opportunity by my publisher to edit the first book in my series, and I was so grateful. You're right - we still love those first books, but they suffer some from being our first efforts. Never having read this series, I am now very interested in doing so. Great giveaway as well!